In March, the Facility for Arts Research attended the annual conference for the Association of Writers and Writing Programs in Tampa. 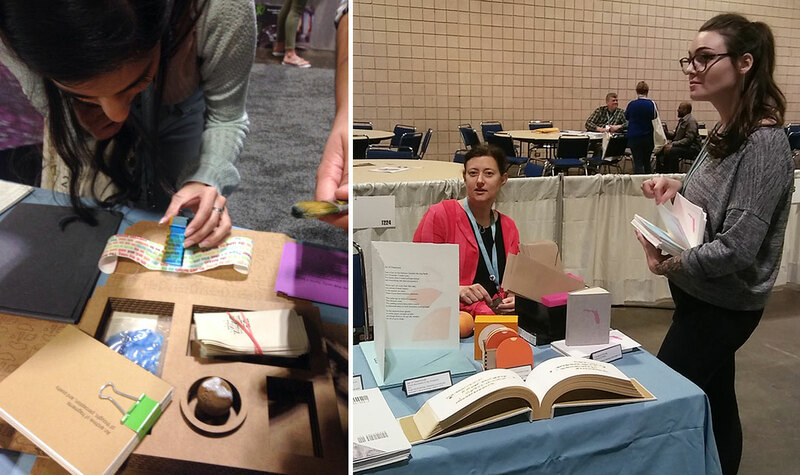 Representatives from the Department of Art, Denise Bookwalter, Haley Lauw, and Elysia Mann, showcased FAR’s collaborative mission with work from Small Craft Advisory Press and Comma Project. The FAR table garnered wide attention among the hundreds of exhibitors, and forged new connections with conference attendees who were interested in cross-genre collaboration. The Association of Writers and Writing Programs provides opportunity, resources, and advocacy to the writing community. The mission of the AWP is “to foster literary achievement, advance the art of writing as essential to a good education, and serve the makers, teachers, students, and readers of contemporary writing.” The AWP annual conference and book fair is the largest literary conference in North America featuring over 2000 presenters. The AWP seeks to foster a passion and further involve the community in creative writing.